You may have noticed a beautiful, recent addition to the park's horticulture. On the eastern edge of the gravel that surrounds the lawn, two dramatic planters have been installed thanks to park neighbor Lord & Taylor. They are overflowing with a stunning array of roses in peachy hues, adding a pop of color in an area that lacked it. Lush plantings overflow from the new planters. Lord & Taylor also added a pop of color at this week's HBO Bryant Park Summer Film Festival, distributing roses and lollipops to film fest goers. You can catch them for the rest of the season at the Film Fest with other treats and giveaways. Thanks for the dash of style! Lord & Taylor roses are in full bloom at Bryant Park this summer. 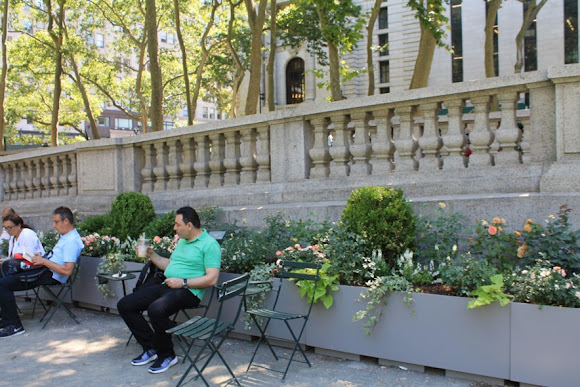 To celebrate the reintroduction of its brand icon, the Free Spirit rose, and expand the rose's presence beyond the retailer's walls, Lord & Taylor has partnered with Bryant Park Corporation to plant rose beds in this Midtown oasis.